Today she’s a princess; tomorrow, a monster; the next day, a clown. For Delilah, each day becomes an adventure when she looks in the mirror and sees herself as someone new. While it’s fun at first, Delilah soon notices that she’s not in control of who she becomes each day. 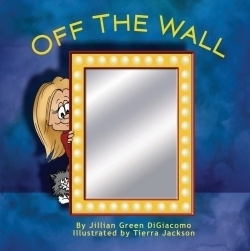 In Delilah, first-time author Jillian Green DiGiacomo has created a character both kids and adults can identify with. Delilah is a carefree girl who sees herself, in her bedroom mirror, as others see her. When her dad calls her a princess, she becomes a fairy tale princess—which is fun! Tierra Jackson’s illustrations capture Delilah’s surprise and pride once she sees herself in a pink gown and crown. And, since she looks like a princess, she starts to act like one too. But Delilah soon finds that she becomes whatever other people see her as, which is a problem when she meets up with her brother, Howard, who calls her a monster. Delilah looks in the mirror and sees herself as a grouchy green monster. The next day at school, she acts like a mean monster, frightening the other kids and jumping on her desk. Each day Delilah changes into someone new until she realizes that if she doesn’t take control, she’ll never be herself … the person she wants to be. The vivid illustrations in Off the Wall combine with lively prose to bring young readers into Delilah’s world. Everyone knows what it feels like to be called a name, but Jillian Green DiGiacomo shows how easy it is for names to become part of one’s identity. When Delilah was called a monster, she saw herself as a monster, then she acted like a monster, and finally she became one. But, as Delilah shows readers, no matter how others see you, you can ultimately decide who you want to be.